The 2018 Nissan Leaf is an all-electric that has been around the block a few times. Not as many times as you might think, since it has much lower range (at 151 miles) than the Chevy Bolt (at 238 miles) and the fully equipped Tesla Model S (at 315 miles). Yet, in a recent test, there are a few high-tech options that will make you wonder if this might be the right EV for you. First, you should know that the Leaf is a budget car in every sense of the word. It’s meant to be light, not that sporty, small, and a bit short on tech features. The amazing touchscreen display on the Bolt and Model S help you manage all of the settings and see what's happening with the electric motor at all times. The Leaf, not so much. The display is small and a little disappointing – you won’t see any animations of a car that shows how regenerative braking works. Instead, you’ll see a bland blue and black display that shows simple data feeds like the range and how many extra miles you can gain from turning off the climate control settings. For any tech connoisseur, it might be a letdown given the trend in cars to provide richly detailed touchscreens, both above the steering wheel and in the dash. The Leaf debuted in 2010, and the new model has a few more curves and enhancements, but the displays look roughly the same. Fortunately, there’s a few other features to keep you occupied. One is a new E-Pedal that allows you to drive the car without using the brakes. Essentially, once activated, you can drive the car by pushing the accelerator to speed up, or laying off the accelerator to slow down to a complete stop. It worked like second nature after a little practice. It’s similar to a feature you’ll find on some all-terrain vehicles like those made by Polaris called Engine Braking. In practice, it means the Leaf is regenerating some power as you drive, but you don’t have to think as much about braking. In stop and go traffic, it’s handy because you don’t have to move your foot as much. Another feature to help with range is the Eco button, which provides a little less power for driving and extends the range by a few miles. In our tests, the 151 mile rating is about right, as long as we activated Eco mode and drove in a careful way – easing up to stop-signs and slowly accelerating. Range dropped to more like 130 miles in a few of our tests after depleting most of the battery when we drove in a normal way, merging into traffic, using the air conditioning the entire time, and speeding up quickly. We did like the new Nissan Leaf app, however. With an updated design, the app makes up for the fact that the touchscreen is not as exciting in the car itself. You can check the range remotely, lock the car, and even set up a text message alert to tell you when the Leaf is charged. You can also enable AC so the car is cool when you start driving. And, all of these settings add up to an effective, low-price, all-electric. The Leaf is a smart buy because of the costs to drive it: the range is lower, but so is the price. 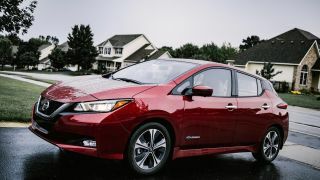 The Leaf is priced at $29,990 and as low as $22,490 with the tax credits. While you might not drive around the block as many times, you won’t pay as much for each trip. On The Road is TechRadar's regular look at the futuristic tech in today's hottest cars. John Brandon, a journalist who's been writing about cars for 12 years, puts a new car and its cutting-edge tech through the paces every week. One goal: To find out which new technologies will lead us to fully driverless cars.